Personally, working in and with many global teams I spend a lot of time in teleconferences and web meetings where much of this power is lost. The maximum of visual input is a set of prepared slides that are shown. 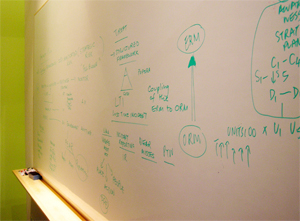 The creative power of standing at a whiteboard and jointly developing a (visual) understanding of the problem and solution is not or hardly possible. Just by coincidence SAP today launched a new product StreamWork which enables Internet-based collaboration, but watching some of the demo videos it appears is also focuses on formal structures like presenations, to-to-lists, tasks, etc. It is also interesting to watch the excellent presentation of Tim Brown (CEO of IDEO) at Serious Play conference, where he discusses IDEO’s approach to brainstorming and creativity. Obviously thinking with hands and brainstorming and personal interaction are key to innovation and creativity. Being a very visual person I’m still looking for Internet-based tools to support this visual interactions. Actually it would be interesting to know whether Internet-based global collaboration changes our decision making and creative process.